Thank you for your interest in the hangars at the Columbus Airport – Columbus GA. The Airport currently leases 140 general aviation hangars with many different types, sizes, and shapes to accommodate your aircraft. Columbus Airport is currently home to over 155 airport-based aircraft, with the majority being housed in Airport hangar units or in corporate hangars. All of the hangars at the Columbus Airport are fully enclosed units and are situated in easily accessible areas throughout the Airport. Columbus Airport Commission currently accepts Visa and MasterCard or can assist you in setting up an auto-pay process. For more information on obtaining a hangar please call 706- 324-2453. 3250 W Britt David Rd. Hangar to Hangar Request: Tenants would like to be on a specific side of the airfield or in a different row of hangars. Single Hangar Request: Aircraft size is specifically for single hangar. 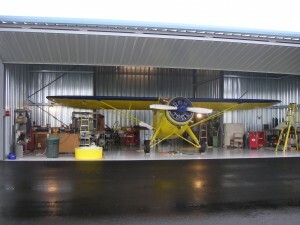 Twin Hangar Request: Aircraft size is specifically for twin hangar. Awaiting Aircraft Purchase: Customers who currently do not own a plane. (It is the tenants responsibility to call and let the airport know when they have purchased a plane to be moved to the proper waiting list). The following list is current as of April 4, 2019. Please click the link below to view the current Hangar Wait List. Signatory is a representative of a Hangar Leaser who is responsible for record keeping of the hangar badge holders. Signatory Training will be provided by the Airport Badge Office located on the 2nd floor of the airport main terminal. Training will be held yearly. Dates and times will be provided by email or you may contact the badge office at 706-324-2449 Ext. 1417 for more information or to set an appointment. Annual Recurrent Training is Required and is by appointment only. A signatory who fails to complete initial or annual recurrent training will be removed as an Authorized Signatory and badges will not be issued. All other badges under that Hangar will also be deactivated. Until the training requirements are fulfilled. Tie down space is also available. For more information contact Michele Renfroe at 706-324-2453.